Animal organs. Nervous system. Pallium. Atlas of plant and animal histology. 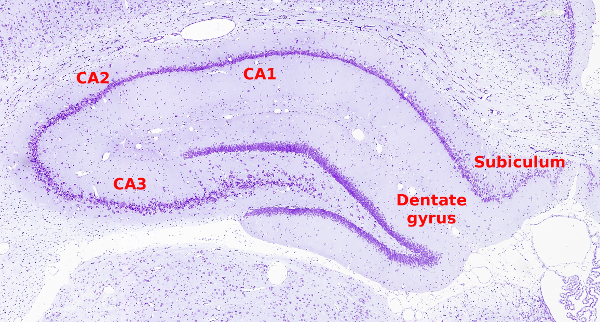 Dorsal pallium of the mouse showing the arrangement of neurons in layers. The pallium is a telencephalic region dorsal to the subpallium. 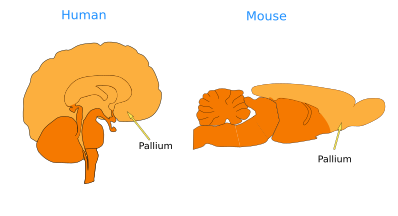 In mammals, the cortical areas are most of the pallium. There are four pallial areas: medial, dorsal, lateral and basal. In mammals, the medial pallium is the hippocampal formation, the dorsal pallium is the cerebral cortex and lateral pallium is the olfactory cortex. 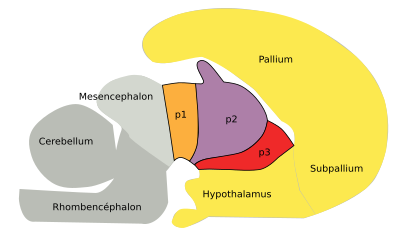 The ventral pallium is composed of part of the olfactory cortex, but also the olfactory bulbs, claustrum, deep pallial nuclei, and the pallial part of the amygdala. Cortical areas organize their neurons in layers parallel to the encephalon surface. For instance, most of the cerebral cortex (known as isocortex or dorsal pallium) is made up of 6 layers, whereas the hippocampus or the medial pallium, and olfactory cortex or lateral pallium, contain less than 6 layers (normally 4 or 5). Cortical areas are heavily connected with areas of the same cerebral hemisphere (ipsilateral connections) as well as with the areas of the other hemisphere (contralateral connections). Contralateral connections are formed by a huge amount of axons organized in axon tracts known as commisures. The most prominent commisure of the pallium is the corpus callosum, by which the dorsal cortex of the two hemispheres are communicated. Medial pallium or hippocampus from a mouse encephalon. The different areas are depicted. The pallium performs many and diverse tasks, many of them related to the human higher cognitive functions, such as learning, different types of memory, intelligence, emotions, abilities related to language, social competences, and many more. However, it also receives primary sensory afferents from olfactory receptors and is responsible for the voluntary or conscious movements.